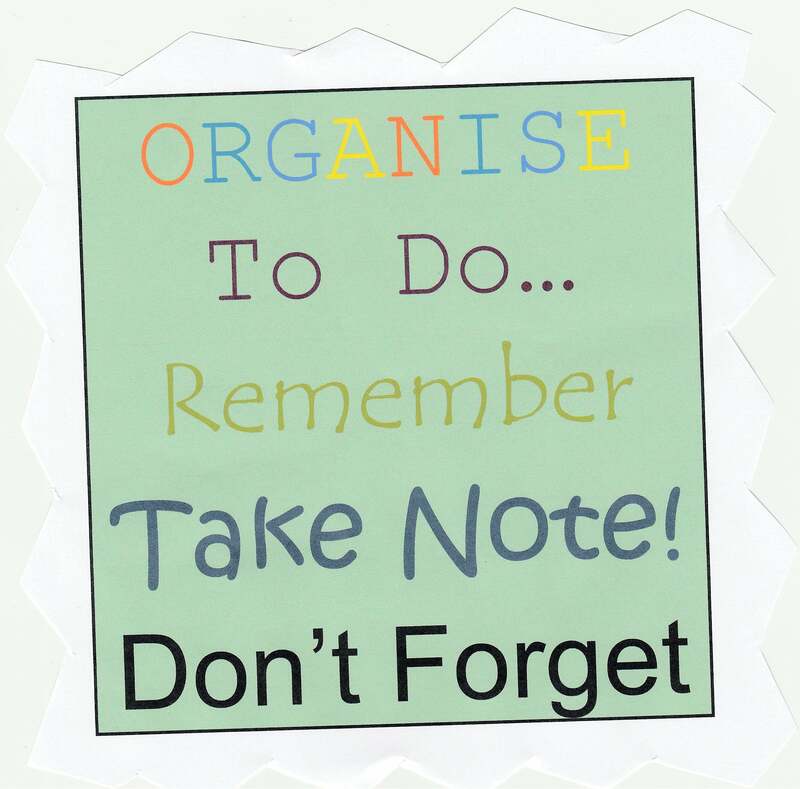 Pinboards or whiteboards in bedrooms are great places to put important papers that mustn’t be lost and to write reminder messages and To Do lists. Encourage teenagers to write important deadlines and appointments on their board and prompt them to check their board if you think they have forgotten something. Checklists are also a fantastic aide memoire to support an immature brain (and an older one too!). Don’t rely on your teen checking a notebook though – put checklists on the fridge (‘don’t forget to do this before dinner’ checklist) or by the front door (‘list of equipment needed for school’ checklist) where they will be seen at the right moment. (I have even been known to tuck notes into my son’s school shoes…). Or why not encourage your teen to use that expensive smartphone to remind him/her when they are due somewhere or when something has to be done?! Routines can be propped up using diaries, timetables and activity schedules. Some teens love a trip to the stationer’s to buy colour-coded notebooks whereas others prefer a simple chalk board – whatever lights their fire and gets them organised. The more they use their planning skills, the quicker those neurons will develop. If you enjoyed this post, you might find Supporting children through exams and Parenting Teenagers: a beginner’s guide interesting too. Helpful? Subscribe to monthly newsletters. Thanks! This makes so much sense. Both my 15yo and my nearly 13yo are so disorganised and forgetful and I definitely do find myself nagging! I’m pleased to say my younger son has started setting reminders on his phone of his own accord and it’s been a definite help! I struggle with convincing my youngest that if he just relies on memory he is more likely to forget – no matter how many times he forgets he stills seems to think he will of course remember next time (optimism over experience!). He writes things on his hand – not pretty but does seem to work. My teenagers all seem to go through a goldfish stage where they can’t remember more than one instruction or task. Have you found that? It’s like having a little person again, where you have to write a list or tell them to do one thing and then give them the next instruction when they come back. Lists have stayed with us now and we use them for lots of communicating in our house. My teenager will ask me one minute “What’s for dinner?” (he likes his food!). And I will tell him. Ten minutes later he will come back and ask “What’s for dinner?”. I tell him I have already answered that questions and prompt him to see if he can find the answer in his brain – sometimes he can and sometimes he can’t! This explains a lot! I like the idea of notes by the front door! I can’t guarantee they will remember to look at the notes of course…….